Friday morning normally sees the return home of the Great Yarmouth short stayers and the first I observed was one of Shearings' 2013 registered Setras heading west over Haven Bridge. Arriving at the Carlton Hotel, another Shearings turned up in the form of relatively new Mercedes Benz Tourismo 149 BU18YTD. Also observed on Marine Parade was yet another Tourismo, CR14RAM, from the Rambler Coaches fleet. Another Rambler, in Just Go branding, was awaiting me on Prince's Road. This time it was BG14OOE - a Volvo B11R with Jonckheere bodywork. I quite often receive emails regarding bus workings but this one came as a complete surprise. Whilst not locally related it may be of interest to our south coast readers. John Hutchinson was recently in contact and some locals may remember the name as he was a one-time editor of the ECTS magazine Terminus. He is now Secretary of the John Jarrold Printing Museum in Norwich and receives all manner of requests, including the one he is about to share with us here. "As a regular peruser of your excellent website and knowing of your interest in buses in the Worthing area, attached is a print of something a little different which I hope will tickle your fancy, namely a Worthing Motor Services bus dating from the early 1900s, apparently on its way to the Lake District! The story behind the picture dates from last year when we were contacted by a Roger Warwick, residing, I think, in Northamptonshire. He had purchased a printer's plate on ebay showing the vehicle concerned and got in touch with us to see if we could provide a decent print of it - which we dutifully obliged him with. So, he had obviously done some pretty impressive researching to come up with that information." My thanks to John for the information and the illustration. No doubt the journey from and to the south coast must have been 'interesting' to say the least! 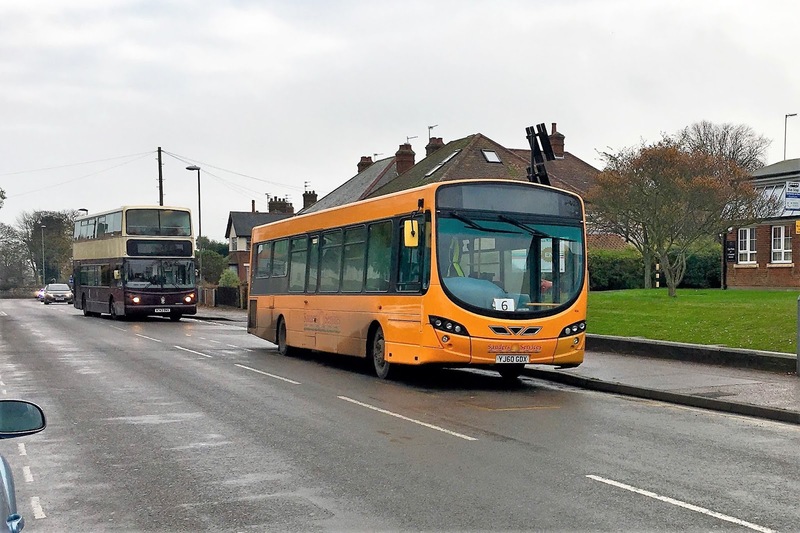 After a quiet period regarding changes to local buses services, today's East of England Traffic Commissioner's Notices & Proceedings Report contains a number of alterations by First Eastern Counties and Konectbus. These changes have been made to reflect the revised town centre routing and there will be no timetable alterations. With Station Square being closed for some weeks heading out of town towards Pakefield, all buses have diverted via Battery Green southbound. This has seen a significant reduction in delays so it was decided to make this route permanent from 6th January 2019. * 84 Harleston to Norwich including the rerouting of the 14:20 from Harleston via Trowse to cater for Framlingham High School students. * 87/88 Bungay to Norwich - withdrawal of route except in the evenings, on Sundays and on Bank Holidays due to unsustainable losses. An hourly timetable will operate between Southwold and Bungay via Halesworth although the 15:53 ex Southwold and the 15:12 ex Halesworth are withdrawn. As mentioned in the previous post, I have been on a short break staying in the Worthing area and it would be rude not to include some highlights of the stay! On my first morning there (19th), I went to Brighton Road to get my paper and found the road completely blocked. Apparently an RTA on the A27 caused the chaos and I got this photo of the 700 Coastliner 10946 SN18KNK stuck in traffic. Chatting to the driver I found that he had travelled around a quarter of a mile in just three hours. Despite that he was cheerful and said that, as long as he his flask of coffee to see him through, he was a happy man! Compass Bus driver trainer 310 S516JJH which had a similar role with Reading Buses. Later that day we had the trek over to Durrington Tesco for supplies, whilst yours truly opted out and disappeared to the Compass Bus depot on Faraday Road. Again I was warmly welcomed by the staff with one even remembering me from last time! They were very helpful in making sure I was correctly attired in my hi-vis tabard! I was told that they were currently trialling a tri-axle Irizar bodied Scania, with an option to purchase, which was due to return shortly. I noted Enviro200 4111 GX13FSL was awaiting repairs following front end damage and that long withdrawn Dart 4003 VX05UHS was being used as a temporary dry store for children's Christmas presents prior to scrapping. Unfortunately the Scania didn't return before I left. Next is Metrobus Scania OmniCity 6556 YN55PWU which has received a livery celebrating the 70 years of Crawley New Town. 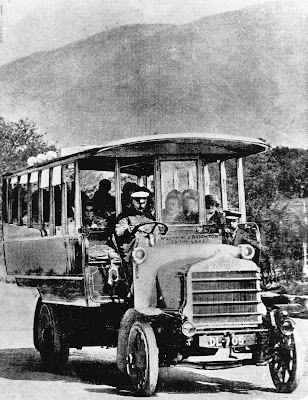 It arrived on the mainly half hourly 23 service from the town. Meanwhile, South Downs green liveried ADL Enviro200 27198 SN63YPU was working off route on the Pulse service in South Street. Regular blog visitors will probably note that it's been a little quiet on here lately - there's a good reason for that as I have been on a short break down on the south coast. Whilst there, a visit to Brighton was in order last Wednesday (21st) and naturally some photos were taken. 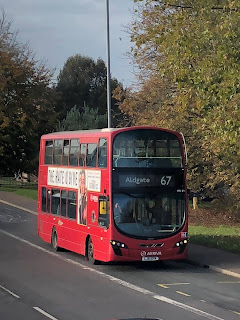 The first shows Big Lemon ADL Enviro200 YX10FEJ on the 47 to East Saltdean, though not in in the traditional Big Lemon colours as it still wears its Abello London red. Since our last visit, Compass Bus has secured a contract to operate the Brighton & Hove tendered 37/B service. Four new Citybuzz branded Dennis Enviro200 MMCs have been purchased for the work and seen in North Street was 4303 YX68UJW which has been named Honey Bee. It is being passed by Brighton & Hove Wright StreetDeck 926 BX15ONA. The other major operator in the area is Metrobus and its Scania N270UD OmniCity 6977 YP09HWJ is nearing its journeys end passing Steine Gardens. It was previously Brighton & Hove's 722. Brighton & Hove (B&H) are currently using well travelled Wright StreetDeck Demonstrator 703 SN64CTU. It is currently enjoying its second stint with the operator and is covering for warranty work on similar vehicles in the B & H fleet. A notable vehicle making regular visits to the Steine Gardens area during the day was this Irizar bodied Scania K250UB4 registered SC13BUS. 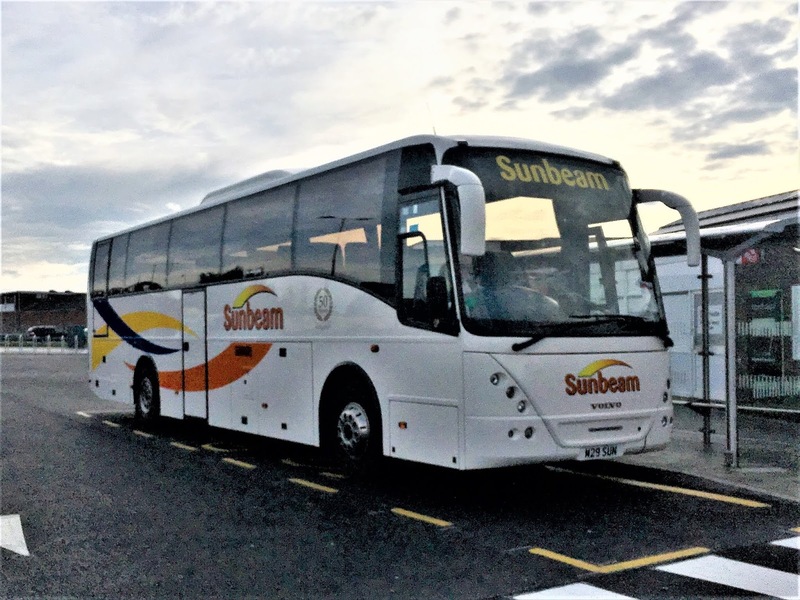 Lucketts Group subsidiary Worthing Coaches has acquired the former demonstrator from the Scania dealer at Worksop to provide contracted service UB1 for the University of Brighton. Its light blue livery has slogans 'Where the Curious Connect' on the offside and 'A place like no other' on the nearside. As it began to get dark there was the opportunity of getting some photos of Brighton buses under the Christmas decorations and Brighton & Hove's Volvo B9TL/Wright Eclipse Gemini 407 BJ11XHG is shown on Western Road heading for the station. Apologies for the comparatively poorer quality photos which were taken on my mobile phone as I had left my camera at home. Two ADL Pointer Bodied Darts have arrived at Caister Road this evening after being transferred from First Cymru. The pair were new to First Bristol in 2006. Both will be allocated to Great Yarmouth. 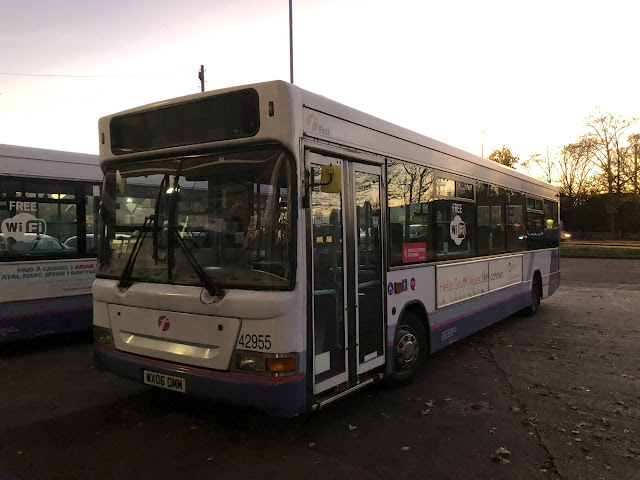 The pair are 42955 WX06OMM and 42956 WX06OMO, Their arrival means that some Volvo B7L single decks are to be withdrawn in the near future. Many Thanks to Will Drake for being on the spot when the arrived after the long journey down from Wales. Following yesterday's post on Wednesday Wonderings regarding the National Holidays' Mercedes Tourismo, I was able to get a photo of it on Marine Parade early this morning. NH16TEH was waiting outside the Royal Hotel on Marine Parade no doubt ready for the return journey home. 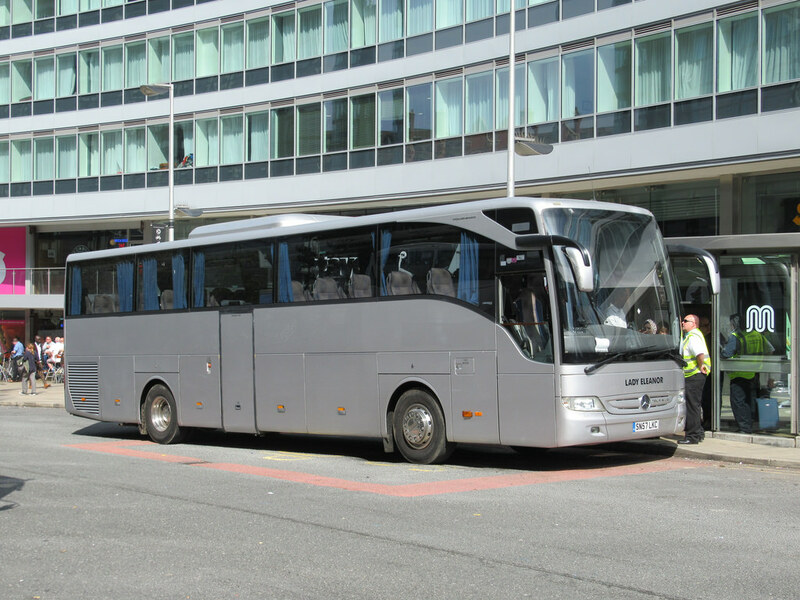 Nearby was Ambassador Travel's Sansundegui bodied Volvo B11R 256 BV17CUA loading passengers for their return too after their short stay at the Nelson Hotel. 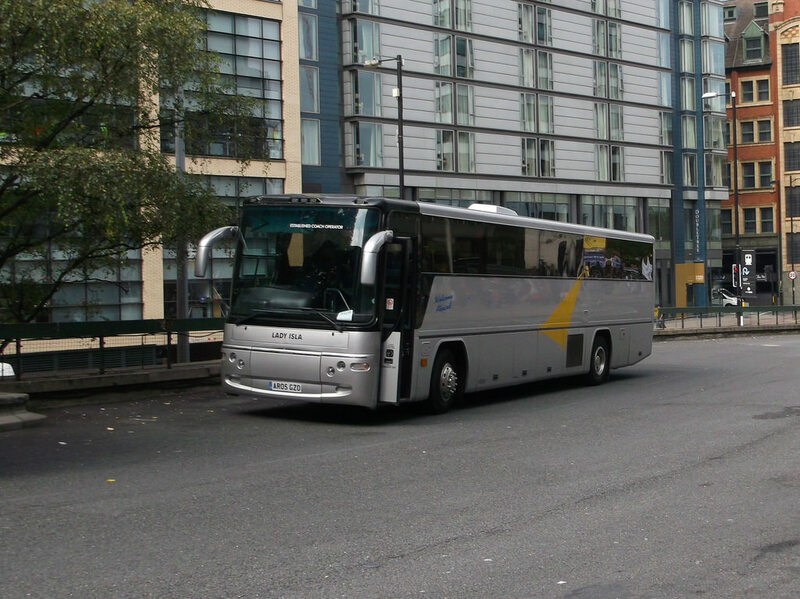 Other coaches were also preparing for their return home including the two Alfa Travel Tourismos and the similar Shearings Holiday's example mentioned in yesterday's report. Following a tip off from 'Reg Vardy', I managed to get to the East Norfolk Sixth Form College on Church Lane in Gorleston earlier this morning. Shortly after another First Lowestoft vehicle arrived on the 882 from Oulton Broad in the shape of ADL Enviro200 44532 SN62DBO - again the destination display wasn't showing in the photo. Following a wander around the usual haunts during early yesterday afternoon, I discovered Shearings' Mercedes Benz Tourismo 140 BU18YSS resting on Marine Parade. Unfortunately it wasn't parked in a very good position for a photo bearing in mind the low sun and the placing of the street furniture but this is the best I could do. Looking in at Beach Coach Station I found two Alfa Travel Tourismos - 81 BX14LCK and 66 BN12CLV. Both were parked facing east which again made photography an issue with the low sun. The Bernard Matthews procession arrived outside the Coach Station shortly after with three First ALX400 bodied Volvo B7TLs in charge. 30954 YJ51RDO leading, 32063 W223XBD bringing up the rear with 32065 W425SRP providing the filling in the sandwich. Finally, National Holidays' Tourismo NH16TEH passed through Market Gates Bus Station on its way to Marine Parade to unload its passengers - too quick for me to get a reasonable photo! Some of you regularly using the angliaandthamesvalleybusforum.com version of the website may be experiencing some difficulty having been faced with 'domain name expired' message. 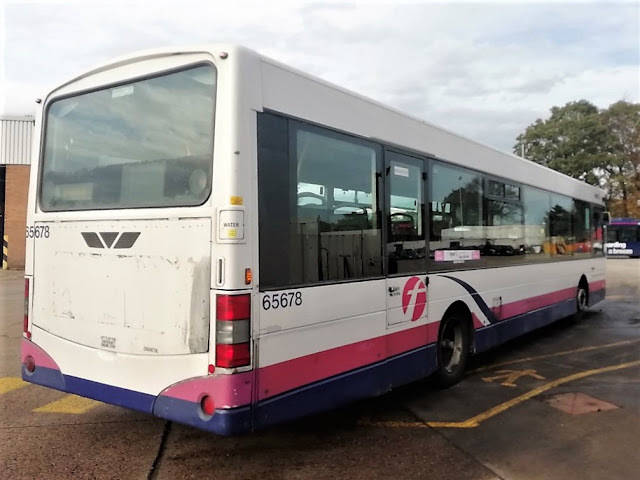 With five days remaining, First South West Falriver liveried Trident T819LLC, has been advertised as being available at £3,500. 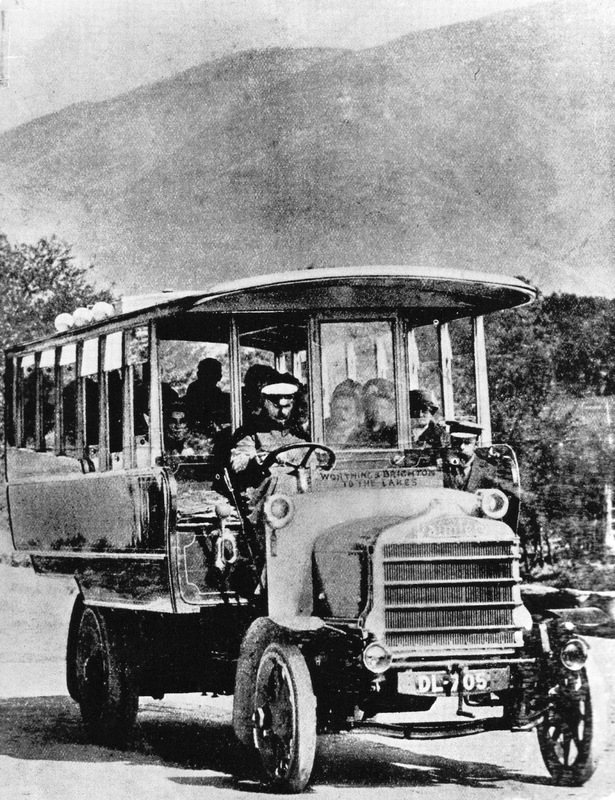 It was new to Capital Citybus in June 1989. Unbeknown to me is the fact that Belle Coaches runs two of its three Norwich City Football Club excursions to Carrow Road via Great Yarmouth or Gorleston. I observed the Great Yarmouth service in the Market Gates area at lunch time yesterday with Kassbohrer Setra LIL9718 doing the honours. I expect the return journey was enjoyable with the Canaries wining a seven goal thriller in added time after being 2-3 down at 90 minutes! Later in the afternoon, at last I got a photo of ex First Southampton Trident 32809 T809LLC back in revenue earning service at Great Yarmouth. Following last month's MOT, its main use has been on the 8s between the James Paget Hospital and Caister. A couple of Belle Coaches were at Great Yarmouth's Beach Coach Station late this morning. They were thought to be providing a shopper service from the Lowestoft area. Rear Sightings of Recent Norwich Arrivals! Following our previous report of a Scania expecting to arrive at Norwich this weekend, I can now confirm it arrived yesterday. It's delay was due to it feeling a little poorly in Essex this weekend. One of the recently arrived Volvo B7TL/ Alexander ALX400s was noted out in Norwich yesterday. 30948 YJ51RRV was also showing its rear in St Stephens Street!! Both of the former Oldham deckers are expected to see use on Bernard Matthews contract duties from Tunstead. Just one relevant entry in today's Notices and Proceedings Report, published by the East of England Traffic Commissioner. 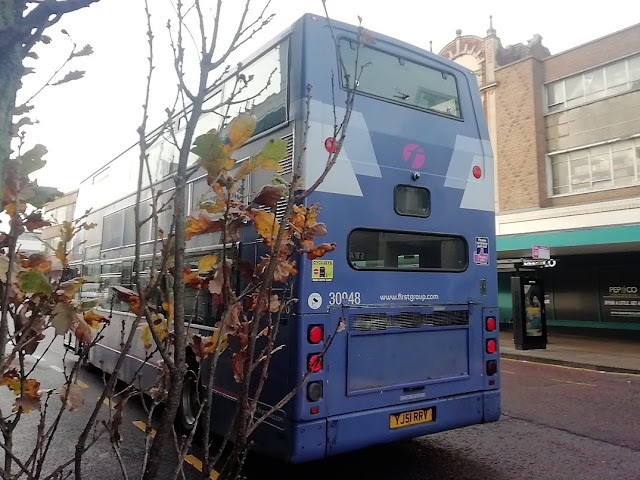 It concerns the amendment of the route, stopping places and timetable of the National Express 375 Great Yarmouth Market Gates to Birmingham Coach Station service. Changes to take effect from 20th November 2018. Arriva LJ11EFM in Norwich, but why? After a few days of receiving emails and comments on fake news, I am thankful that I moderate the comments sent to this blog. Not only are they completely without foundation but they would cause some unrest in the companies concerned and would also feed duff information to enthusiasts too. That's in addition to the spam received! You can, therefore, imagine my scepticism when I received the following message and photo from Reece Collinson. I believe the message to be genuine and that's the reason that I am publishing it. Surprising that the destination says its heading for Aldgate on the 67 too! If any of you are aware of the reason for its appearance both Reece and myself would be pleased to know. Following the same post on our Facebook page, another contributor provided a similar photo of the same bus also on Dereham Road thereby corroborating Reece's photo. 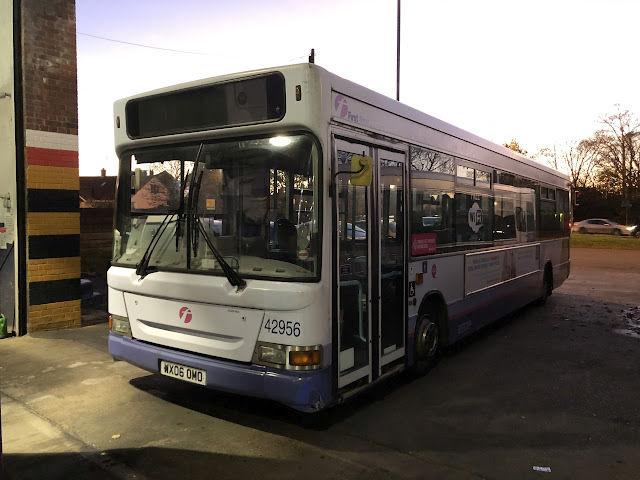 Subsequently a Twitter follower said it was at Volvo's Sweet Briar Road premises for warranty work and the photo was probably of LJ11EFM being road tested in nearby Dereham Road. This was also confirmed by a Facebook follower but it is quite a distance to travel for some warranty work! It was apparently sent to Norwich to even out the workload as many Volvo plants are busy doing work on other Arriva London buses. My thanks to Reece for taking the effort to write in with the photo and my apologies for doubting his integrity. My thanks also to the local bus enthusiast community for swiftly coming up with the reason for its appearance in the city. With engineering work being carried out on Norwich to Great Yarmouth/Lowestoft railway lines today, rail replacement bus services were again the order of the day. Standing in reserve on the Asda service road, behind the station, was Ambassador Travel's KIG8458. The Sunsundegui Sideral bodied Volvo B12M was previously registered FJ06BRF and carried fleet number 251. Another three former Reynolds Coaches have been tracked down in the North West of England with Sky Coaches. The Manchester based operator has been using at least two of them on rail replacement following work on the electrification of the Manchester to Preston rail line via Bolton. The trio acquired are Dennis Javelin AR05GZO and Mercedes Benz Tourismos SN57LKC and BV10ZKA. The first two were captured on film by Rossendalion2013 at Manchester Piccadilly on 1st September 2018. It is also believed that fourth member of the former Reynolds fleet, Volvo AT07GYZ, is also with Sky Coaches but that has yet to be confirmed. This weekend sees the arrival of three more vehicles at First’s local depots to help with additional vehicle requirements for Bernard Matthews contract work in the lead up to Christmas. From First's Oldham garage there will be two more ALX400 bodied Volvo B7TLs in the form of 30947 YJ51RRU and 30948 YJ51RRV. They join five similar vehicles in Norfolk which arrived in Great Yarmouth from the Greater Manchester depot during May this year. Another Wright Solar bodied Scania L94UB is also due from First Essex with 65678 YP02APN expected which is similar to two others loaned to Great Yarmouth late last month. Early yesterday afternoon saw two Alfa Travel Mercedes Benz Tourismos taking up residence at Great Yarmouth's Beach Coach Station. They were 80 BC14LCJ and 81 BC14LCK. After W223XBD's quick getaway, W422SRP and YJ51RDO are left still picking up their passengers.